A column or pillar in architecture and structural engineering is a structural element that transmits, through compression, the weight of the structure above to other structural elements below. In other words, a column is a compression member. The term column applies especially to a large round support (the shaft of the column) with a capital and a base or pedestal and made of stone, or appearing to be so. A small wooden or metal support is typically called a post, and supports with a rectangular or other non-round section are usually called piers. For the purpose of wind or earthquake engineering, columns may be designed to resist lateral forces. Other compression members are often termed "columns" because of the similar stress conditions. Columns are frequently used to support beams or arches on which the upper parts of walls or ceilings rest. In architecture, "column" refers to such a structural element that also has certain proportional and decorative features. Ccncrete mixer machine: For smaller jobs, such as residential repairs, renovations, or hobbyist-scale projects, many cubic yards of concrete are usually not required. Bagged cement is readily available in small-batch sizes, and aggregate and water are easily obtained in small quantities for the small work site. To service this small-batch concrete market, there are many types of small portable concrete mixers available A typical portable concrete mixer uses a small revolving drum to mix the components. For smaller jobs the concrete made at the construction site has no time lost in transport, giving the workers ample time to use the concrete before it hardens. Portable concrete mixers may be powered by a gasoline engine, although it is more common that they are powered by electric motors using standard mains current. These concrete mixers are further divided based on their loading mechanism. Cement, sand and other aggregates are loaded in a hydraulically operated hopper and then poured in the mixing drum for final mixing and then can be unloaded by tilting the drum. While in Hand Feed Concrete Mixers, cement, sand and other aggregates are directly added to the mixing drum manually. These both type of concrete mixers are highly popular and used in regular construction activities in Africa, some Middle Eastern Countries and in the Indian subcontinent. We are the one of the best scaffolding hiring company , today, metal scaffolding is the norm. It’s lightweight without compromising strength. Tube scaffolding is quick and easy to assemble without the need for nuts and bolts. The metals used for scaffolding are typically steel. Steel scaffolding has great strength and durability. At the same time it has a certain amount of elasticity which helps prevent cracks. Steel can support very heavy loads, and workers can use it to transport heavy equipment and supplies. For tall structures, steel is a necessity as the weight of the scaffolding itself requires structural strength that only steel can provide. For less demanding conditions, aluminum scaffolding can be a viable alternative. With the use of metal scaffolding, workers are able to safely access high and remote locations. By incorporating diagonal bracing, structures of great stability can be built. Metal scaffolding structures have three basic elements: Standards Ledgers Transforms The standards are the vertical tubes which run throughout the entire structure and keep it upright. They transfer the weight of the structure to the ground via a square base plate which spreads the load. The ledgers are the horizontal tubes connecting the standards to keep the structure in place and ensure stability. The transoms are horizontal tubes placed across and perpendicular to the ledgers to give the structure more strength and to provide a support for the platforms on each level of the scaffold. EARTH RAMMER: The compressive strength of rammed earth is a maximum of 4.3 MPa (620 psi). This is less than that of concrete but more than sufficiently strong for domestic edifices. Indeed, properly constructed rammed earth endures for thousands of years, as many ancient structures that are still standing around the world demonstrate. Rammed earth reinforced with rebar, wood, or bamboo can prevent collapse caused by earthquakes or heavy storms,  because unreinforced edifices of rammed earth resist earthquake damage extremely poorly. See 1960 Agadir earthquake for an example of the total destruction which may be inflicted on such structures by an earthquake. Adding cement to soil mixtures poor in clay can also increase the load-bearing capacity of rammed-earth edifices. The United States Department of Agriculture observed in 1925 that rammed-earth structures endure indefinitely and can be constructed for less than two-thirds of the cost of standard frame houses. Soil is a widely available, inexpensive, and sustainable resource. Therefore, construction with rammed earth is very viable. [vague] Unskilled labour can do most of the necessary work. While the cost of rammed earth is low, rammed-earth construction without mechanical tools is very time-consuming and laborious; however, with a mechanical tamper and prefabricated formwork it can require only two or three days to construct the walls of a 200 to 220 m2 (2, 200 to 2, 400 sq ft) house. One significant benefit of rammed earth is its high thermal mass: like brick or concrete, it can absorb heat during daytime and nocturnally release it. This action moderates daily temperature variations and reduces the need for air conditioning and heating. In colder climates, rammed-earth walls can be insulated with Styrofoam or a similar insert. It must also be protected from heavy rain and insulated with vapour barriers. Rammed earth can effectively regulate humidity if unclad walls containing clay are exposed to an internal space. Humidity is regulated between 40% and 60%, which is the ideal range for asthma sufferers and for the storage of susceptible objects such as books. The material mass and clay content of rammed earth allows an edifice to breathe more than concrete edifices, which avoids problems of condensation but prevents significant loss of heat. Untouched, rammed-earth walls have the colour and texture of natural earth. Moisture-impermeable finishes, such as cement render, are avoided because they impair the ability of a wall to desorb moisture,  which quality is necessary to preserve its strength. Well-cured walls accept nails and screws easily, and can be effectively patched with the same material used to build them. Blemishes can be repaired using the soil mixture as a plaster and sanded smooth. The thickness, typically 30 to 35 centimetres (12 to 14 in), and density of rammed-earth walls make them suitable for soundproofing. They are also inherently fireproof, resistant to termite damage, and non-toxic. 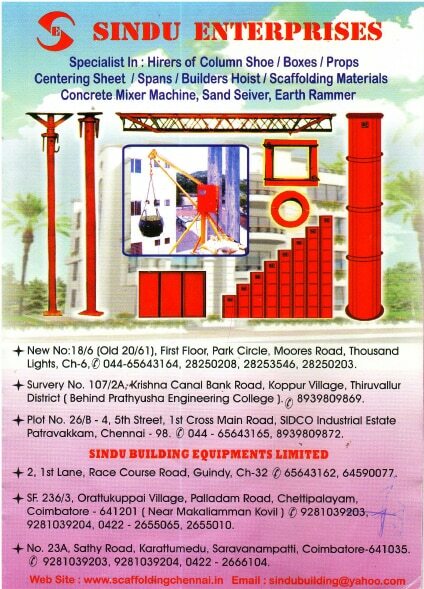 Sand Seiver Suppliers Are you looking for any Sand Seiver Suppliers and Contractors.We provide the Best Sand Seiver for house and building purpose.Kindly call us for more information regarding the products and best price.